As long as kids have been kids, they have been bringing home goldfish in plastic bags and bowls from the country fair. But what do you do when you get them home? How will you take care of them? There are two types of fish: those that can thrive in freshwater and those that can thrive in saltwater. Before you buy an aquarium and the fish to go into it, you have a decision to make. Will it be freshwater or will it be saltwater for your aquarium? Tropical fish are beautiful to look at no matter what their markings. Some are more finely dressed than others but if you’ve never dealt with them before you will be amazed by them all. But each fish has different requirements for their living environment. For beginners, fresh water aquariums are easier to take care of. You can use water from your tap to fill up the tank. Of course, you will need to de-chlorinate the water before adding the fish but there are kits available to help you with that. Fish that thrive in freshwater are not necessarily too particular about where they swim. What is important is the temperature. Tropical fish, as you might already have guessed, like to have things a bit warm. But, you can monitor this with a thermometer in your tank. Freshwater aquariums are not as expensive as the saltwater variety. You can get a thirty gallon tank with filter for about $100. This sounds expensive but in the long run you will save money because you won’t have to spend more on additional equipment. Freshwater tropical fish are also less expensive than saltwater fish. 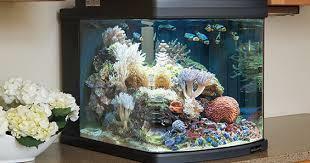 Saltwater aquariums can be lots of fun but they do require more work. This is why most beginner fish lovers may choose a freshwater aquarium. But, you can manage if you are dedicated and willing to learn all that is required to keep a saltwater aquarium running smoothly. Tropical fish that favor saltwater are a little more delicate than the other fish you may be used to, at least in the beginning. Setting up their environment is crucial to their survival. It all begins with the salinity of the water. With a saltwater aquarium it is important to monitor the salt levels in the water. Too much salt and the fish could die. Too little salt and the same thing could happen. You won’t want your fish to die since you will have paid a great deal of money for them. Tropical saltwater fish cost quite a bit more than freshwater fish. Their care takes a bit more time to maintain as well. So, you have decided to take care of fish. That’s a great idea. Your first decision is whether to invest in a freshwater or a saltwater aquarium. Hopefully these tips will help you get started.